- Example Business Essay - Custom Essay Writing Service UK for Your Academic Success! - Custom Essay Writing Service UK for Your Academic Success! 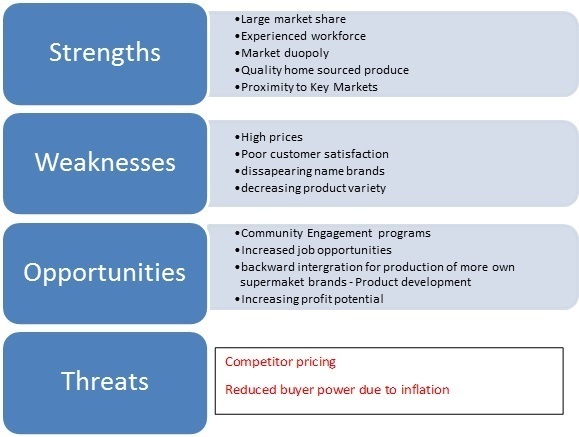 Analyse the business environment for Coles supermarket chain. Coles is a national supermarket chain; liquor, fuel and convenience retailer in Australia. It was acquired in 2007 by Wesfarmers, “a diversified Australian company with strong, established market positions and recognised brands with the objective of delivering satisfactory returns to shareholders” (Wesfarmers, 2013, p.4).. According to Wesfarmers (2013), Cole’s sole purpose has been to give the Australian people a shop they can trust, to deliver quality, value and service. This essay takes a critical look at the company, its current position, the internal capabilities, and its external environment, and considers strategic changes necessary to ensure Coles maintains its traditional offering of long term value creation. Furthermore, this essay gives consideration to the current growth strategies adopted by the company and questions if these practices are the best options going forward, for delivering sustainability of the group’s strategic framework. Working with suppliers to further develop strong sustainable relationships. Coles’ revenue in 2013 was $35.8billion, an increase of 4.9 per cent from the previous year. 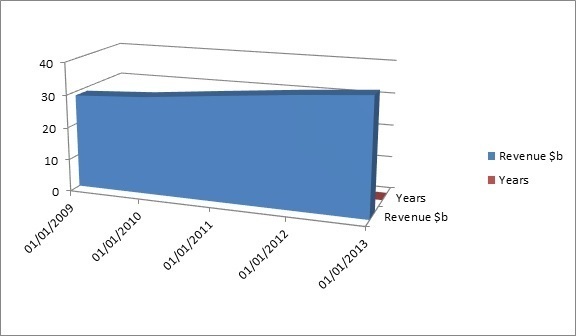 Its five year financial history report (See Appendix1) shows a steady growth in revenue generation. “Coles delivered earnings growth of 13.1 per cent to $1,533 million, building on the 16.3 per cent and 21.2 per cent earnings growth in the 2012 and 2011 financial years respectively” (Wesfarmers 2013, p. 3). Source: Adopted from Wesfarmers 2013, Annual reports. Embark on second wave of transformation with a focus on quality, service and value. And take advantage of further store renewal opportunities, supply chain transformation and operating efficiencies; as well as investment in category innovation, Coles brand and development, multi-channel integration and a tailored loyalty offer and a culture of continuous improvement. From its various outlets nationally Coles handles more than 19 million customer transactions a week. Coles claims its customer-focused strategy continues to improve in efficiency and productivity, while investing in lower prices, delivering better quality through its ‘Australian First’ sourcing policy and developing a stronger store base through new store openings and renewing existing stores contributed to it steady revenue growth as the financial indicators have shown. “The transformation of Coles since its acquisition has progressed with operational efficiencies and continued fund reinvestment in price. As well as a sustained turnaround of the business, providing benefits for consumers, suppliers and employees for the past five years thus, delivering a much stronger platform for future growth” (Wesfarmers 2013, p.25). 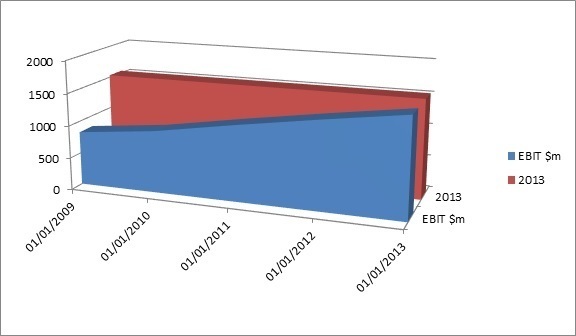 As of the last 2012/2013 financial year, Coles was able to generate earnings before interest and Tax (EBIT) of $1,533m as can be seen in figure 2 below. Source: Adopted from Wesfarmers 2013 Financial Reports. Tables 1 & 2 below show the key financial indicators and Coles’ performance over the past few years. As reported in the Wesfarmers 2013 Financial Reports and shown in table1 above it can be observed that, for year 2012/2013, Coles has generated a healthy return on capital employed (ROE) of 9.5%, and improvement from 8.7% for the previous year. An increase in capital expenditure and liabilities has been due to the company’s support for net capital investments across the Group. This is up to an increase of $1.5 billion to $1.9 billion in 2014. “The group also managed strong credit ratings with Moody’s Investor Service upgrading Wesfarmers’ issuer and senior unsecured long-term debt rating from Baa1 (positive) to A3 (stable) consistent with the Group’s credit rating from Standard and Poor’s of A- (stable)… It settled all outstanding debt in the name of the Coles group and continued to neutralise the dilution that would otherwise have occurred from the Dividend Investment Plan and Employee Share plans”(Wesfarmers 2013, p. 13). Interests, income and expenditure are however not allocated to operating segments at Wesfarmers. This type of activity is managed on a group basis. Revenue and earnings of various divisions are also affected by the effect of high seasonality such as, for the retail divisions like Coles, earnings are typically greater in the December half of the financial year due to the impact of the Christmas holiday shopping period on the retail business. Given the nature and scale of Coles’ business, the impact of macro and micro forces on its operations is considered to be relatively large compared to the standard in the industry. The external market has been assessed based on PEST analysis and Competitor analysis. 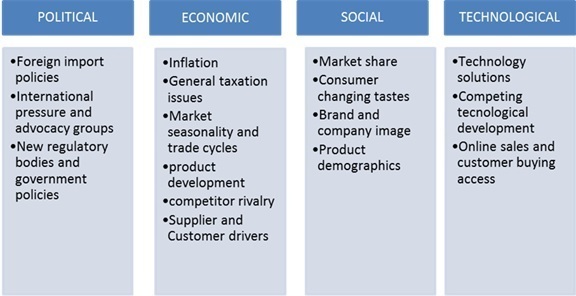 To explore how the macro environment has impacted the supermarket chain industry and Coles specifically, a PEST analysis has been used, which consists of Political, Economic, Social and Technology factors as shown below. The supermarket chain industry attracts a great deal of attention from the government, non-governmental organizations and even advocacy groups. Due to the size of the industry and how significant a component of the economy and social welfare of countries it is, it has trigged debates on the future and current state of the industry on a global basis. The industry is mature in many countries and in Australia, it is considered a ‘duopoly’, which is a market situation where “two companies own all or nearly all of the market for a similar product or service” (Kumar & Sharma 1998, p.229). With regards to Coles and the supermarket chain industry in Australia, the political situation as described in the preceding paragraph holds true. According to the Australian Competition and Consumer Commission, Australia is one of the largest importers of grocery products and it’s a key contributor to the economy of neighbouring countries. Coles is also an equal opportunities employer which provides equal employment opportunities nationwide. Coles also sources products responsibly and contribute positively to the communities in which it operates. The Supermarket chain industry is a high-risk industry, which requires a substantial strategic planning process, customer satisfaction and significant investment. To compete many companies have pursued alliances and joint ventures with shared facilities and outright buy outs to maintain the cost. The global recession of the past years has also had a significant impact on smaller retailers and the supermarket industry as a whole. Aging populations and longer life expectancies, changing taste, healthy living styles and specific dietary requirements have increased demand for more organic food, and have been an important factor in the growth of new brands. In the US and UK, greater life expectancy will depend on diet, exercise and a positive attitude to life and increasing knowledge, according to Newell et al (2006). The Australian government’s plays an important role in promoting exercise, healthy living and a positive culture, which in effect can reduce consumption of certain brands and product demographics for Coles. Increased use of the Internet has helped to reduce media costs and also made room for increase innovation in the supermarket chain industry. Coles has capitalised on the internet to continue to develop its online sales platform which has thus managed to attract interest from younger audiences and increased sales significantly. 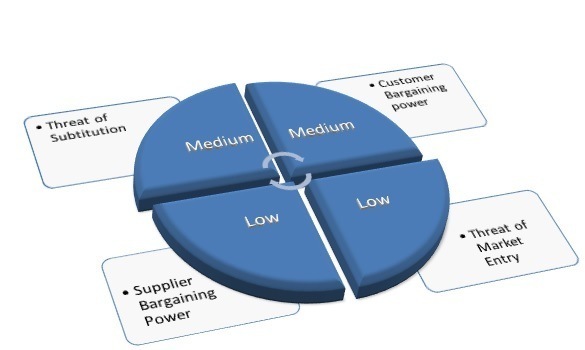 The Five Forces model developed by Michael Porter provides a frame work to identify the competitive nature of an industry. 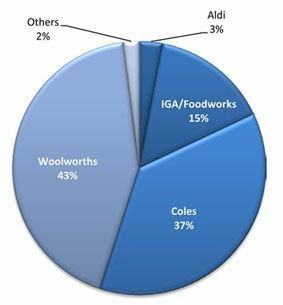 Even though extremely subjective, a broad Five Forces analysis indicates that competitive rivalry within the supermarket chain industry is medium in Australia. As a known fact that, “Australia’s grocery markets is one of the most concentrated in the world, Woolworths and Wesfarmers (owner of Coles) account for almost 80% of supermarket sales, 60% of alcohol retail, 50% of petrol retail and 40% of all retail in Australia” (Ethical Consumer Group 2014). With their large market share they have and continue to exert considerable influence over suppliers and make the playing field extremely tough for much smaller independent retailers such as IGA, Foodland, 7-Eleven, Lucky 7, BP and several other liquor retailers. See figure 5 below. Thus, Coles has only one major competitor – Woolworths; and a few direct competitors such as Aldi and Metcash. These four, Coles inclusive make up the big players in the industry. With each of them having a different and unique operating model, competitor rivalry is therefore high to medium. The market concentration of private label brands from these giants have been blamed for Australia having the fastest rising grocery prices in the developed world. Threat of substitution is therefore also high to medium because there are only four main competitors with similar prices. This is the same reason why customer bargaining power is medium to low, and threat of market entry to compete with the big four is very low. Other competition therefore can only come from local harvests, independent grocers and small supermarkets and recently Costco. In conclusion, there are no real threats or key issues for Coles presently except for the recurrent price wars with its major competitor and concerns about the sustainability of these battles. With continuous market dominance however, leading to Australia’s powerful supermarket duopoly, this could be termed as inhospitable and leaving consumers to revel in cheaper staples. A key to survival of any business is the need to increase revenue and reduce dependence upon financing via debt bearing instruments. Coles, in respect to these strategic options is already in the process of developing new initiatives by reducing its debts and focusing on quality, service and value. Coles is in the forefront of innovation by taking advantage of further store renewal opportunities, supply chain transformation and a strategic approach to improved operational efficiencies and continued fund reinvestment in price. Newell, RG, Jaffe, AB & Stavins RN 2006, ‘The effects of economic and policy incentives on carbon mitigation technologies’, Energy Economics, vol. 28, p. 563 – 578. Mableson, T & Stewart, J 2011, Supermarket shootout: Will the independents survive?, Ferriers Focus, p.2. Porter, ME 2004, Competitive Advantage: Creating and Sustaining Superior Performance, New York: Free Press,. Slack, N, Chambers, S, Johnston, R & Betts, A 2009, Operations and Process Management: Principles and Practice for Strategic Impact, 2nd edn, Pearson Education, Essex, England.